Jonathan Charles "Jon" Gray (born November 5, 1991) is an American professional baseball pitcher for the Colorado Rockies of Major League Baseball (MLB). The Rockies chose Gray with the third pick in the 2013 MLB Draft. Gray previously attended Eastern Oklahoma State College and the University of Oklahoma, where he played college baseball. Gray attended Chandler High School in Chandler, Oklahoma. He played for the school's baseball, basketball, and American football teams, though he focused on baseball in his senior year. That year, he was named the Little All-City Player of the Year by The Oklahoman and was named to the All-State Team. The Kansas City Royals selected him in the 13th round of the 2010 Major League Baseball (MLB) Draft, but he did not sign. Sunny Golloway, the head coach of the Oklahoma Sooners baseball team, representing the University of Oklahoma, encouraged Gray to enroll at Eastern Oklahoma State College, a junior college in Wilburton, Oklahoma, where he could continue to gain experience as a starting pitcher, as he would be used as a relief pitcher if he were to join the Sooners that season. For Eastern Oklahoma, Gray pitched to a 6–2 win–loss record and a 2.89 earned run average (ERA). The New York Yankees drafted him in the 10th round of the 2011 MLB Draft and offered him $500,000 to sign, but he instead opted to transfer to the University of Oklahoma. In his sophomore year at Oklahoma, Gray compiled a 3.16 ERA and 104 strikeouts in 102 2⁄3 innings pitched. As a junior, Gray was named the Big 12 Conference Pitcher of the Week three times. He had a 10–3 win-loss record, a 1.64 ERA, and 147 strikeouts in 126 1⁄3 innings pitched. He was a first team All-American and a unanimous choice for the All-Big 12 team. He was named the Most Outstanding Player of the 2013 Big 12 Conference Baseball Tournament, as Oklahoma won the tournament for the first time since 1997. Gray also won the National Pitcher of the Year Award. Gray was expected to be among the first players chosen in the 2013 MLB Draft, and was considered by the Houston Astros, who had the first overall pick. The Colorado Rockies eventually picked him with the third pick. Gray signed with the Rockies, receiving a $4.8 million signing bonus, which was below the recommended slot value for the pick. Gray made his professional debut with the Grand Junction Rockies of the Rookie-level Pioneer League in July, before receiving a promotion to the Modesto Nuts of the Class A-Advanced California League later in the month. For Modesto, Gray pitched to a 0.75 ERA with 36 strikeouts in 24 innings. The Rockies invited Gray to spring training in 2014. They assigned him to the Tulsa Drillers of the Class AA Texas League for the 2014 season. He pitched to a 10–5 record, a 3.91 ERA, and 113 strikeouts in 124 1⁄3 innings. He missed the first round of the Texas League playoffs due to a tired shoulder. The Rockies invited Gray to spring training in 2015. They assigned him to the Albuquerque Isotopes of the Class AAA Pacific Coast League to start the 2015 season. Gray pitched to a 6–6 win-loss record with a 4.33 ERA and 110 strikeouts in 21 games, including a 2.70 ERA in his last six starts. 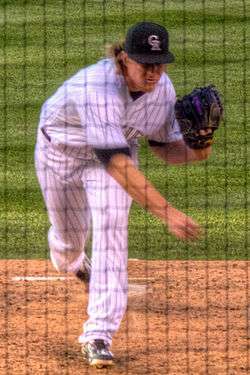 Gray made his major league debut with the Rockies on August 4, 2015. Focusing on his fastball and slider, Gray pitched to a 0–2 record and a 5.53 ERA in nine starts for the Rockies. During the 2015–16 offseason, Gray worked to add a curveball. On May 13, 2016, Gray earned his first career major league win in a 5-2 victory over the New York Mets. Gray works primarily with an overpowering fastball that sits in the 94 to 98 mph range with good movement, and a devastating hard slider with a sharp, late break down and away, able to neutralize both right handed and left handed batters. He also throws an improving curveball in the 75 - 80 mph range that he throws for another look, and an occasional change up in the mid to upper 80s. Gray's brother, Jack Gray plays American football as a linebacker at Northeastern State University. His sister, Brooke McCollough is a softball player who wants to play for the University of Oklahoma; Gray had his Oklahoma teammates leave her encouraging phone messages to keep her motivated. 1 2 3 4 "Oklahoma's Jonathan Gray has climbed MLB draft boards this spring – college baseball – ESPN". Espn.go.com. January 1, 2008. Retrieved April 19, 2013. 1 2 3 Helsley, John (April 9, 2013). "Oklahoma baseball: Jonathan Gray's stock is on the rise: Sooner ace is drawing rave reviews from major league scouts, and might go near the top of June's draft". The Oklahoman. Retrieved April 19, 2013. 1 2 MLB (June 12, 2013). "Rockies sign 2013 No. 3 overall pick Jonathan Gray - MLB - SI.com". Sportsillustrated.cnn.com. Retrieved February 9, 2014. ↑ Jon Heyman (June 11, 2008). "No Gray area: 100-mph-throwing Sooner Jonathan Gray hot prospect". CBSSports.com. Retrieved April 19, 2013. ↑ Ou Media Relations (April 3, 2013). "OU's Gray earns Big 12 Pitcher of the Week » Sports » Claremore Daily Progress". Claremoreprogress.com. Retrieved April 19, 2013. ↑ "Oklahoma wins first Big 12 tournament title since 1997". Tulsa World. May 27, 2013. Retrieved August 2, 2013. ↑ "Former Sooner Jonathan Gray named Pitcher of the Year by College Baseball Hall of Fame". KJRH. Retrieved July 4, 2015. ↑ "Luhnow, scouts considering options for No. 1 Draft pick | astros.com: News". Mlb.mlb.com. Retrieved April 23, 2013. ↑ Snyder, Matt. "Rockies sign third overall draft pick Jonathan Gray under slot". CBSSports.com. Retrieved August 2, 2013. ↑ "Jonathan Gray set to make professional debut Wednesday". OUDaily.com. Retrieved August 2, 2013. ↑ "Rockies fall to Chukars, Jonathan Gray promoted". Nbc11news.com. July 28, 2013. Retrieved August 2, 2013. ↑ Callis, Jim (February 4, 2014). "Pipeline Perspectives: Jon Gray and Eddie Butler give Rockies top duo of pitching prospects | MLB.com: News". Mlb.mlb.com. Retrieved February 4, 2014. ↑ "Prospects Eddie Butler, Jon Gray among Colorado Rockies' invitees | Rockies.com: News". Colorado.rockies.mlb.com. February 4, 2014. Retrieved February 4, 2014. ↑ "Barry Lewis: Top prospects Jon Gray, Eddie Butler to start season with Drillers". Tulsa World. Retrieved February 11, 2015. ↑ Saunders, Patrick (September 2, 2014). "Jon Gray shut down by Rockies because of "shoulder fatigue"". The Denver Post. Retrieved September 3, 2014. ↑ Groke, Nick (February 10, 2015). "Jon Gray, Yohan Flande on Rockies spring training roster". Denver Post. Retrieved February 11, 2015. ↑ Sickenger, Ken (April 7, 2015). "Gray is ready for the Albuquerque altitude". Albuquerque Journal. Retrieved April 10, 2015. 1 2 Saunders, Patrick (August 2, 2015). "Jon Gray scheduled to make major-league debut for Rockies against Mariners: Rockies fans have been waiting for Gray's debut all season". The Denver Post. Retrieved August 3, 2015. ↑ Saunders, Patrick (February 18, 2016). "Jon Gray adds curveball, seeks improvement in 2nd season with Rockies: Colorado's top pick in 2013 makes tweaks, ready to make his mark". The Denver Post. Retrieved February 25, 2016. ↑ Graham, Pat (May 13, 2016). "Jon Gray earns first major league win, Rockies beat Mets 5-2". The Washington Times. Retrieved May 13, 2016.